I cannot think of any 20th century ensigns that had a foul anchor. A foul anchor is used on badges, seals and some flags, but, as far as I know, only those that are not ensigns. During WWII Royal Fleet Auxiliary vessels were owned by the Admiralty and manned by civilian seamen, but their Blue Ensign had a horizontal plain anchor. "On 18 July 2008 the Royal Fleet Auxiliary Service was presented with a Queen's Colour by HRH The Earl of Wessex, on RFA 'Largs Bay' at Portsmouth. The Colour, designed by Graham Bartram, is the first awarded to a civilian organization." 1864. When Squadron Colours were abolished a Blue Ensign defaced with a horizontal yellow anchor became the ensign of Admiralty owned naval auxiliaries. It was known as the Transport Ensign, because its anchor had been the seal of the 1694 Transport Office, but later became generally known as the Admiralty Ensign. 1905. An Admiralty circular of 3 August directed that auxiliary vessels manned by mercantile crews and owned by the Admiralty should be known as Royal Fleet Auxiliaries (RFA). This was an internal matter and the term did not appear in the Navy List until 1913. 1922. The captains of some RFAs chose to fly the Red Ensign instead of the Admiralty Ensign. An Admiralty Fleet Order was issued stating that all Admiralty-owned RFA tankers, including those under commercial management, were to wear the Admiralty Blue Ensign except when on charter to commercial concerns when the Red Ensign should be worn. 1968. HM Queen Elizabeth II approved a separate ensign for the Royal Fleet Auxiliary Service; a Blue Ensign defaced with a vertical yellow anchor. It was introduced from 16 June 1969. 1969. Captain Cartwright RN, Director of Marine Services, designed another ensign in which two wavy yellow lines were placed below the horizontal anchor of the Admiralty Ensign. This was introduced from 29 May 1970, but which vessels were meant to wear it is not clear. It came to be called the Royal Maritime Auxiliary Ensign, but that organisation was not created for another five years. 1974. Various independent units that provided harbour services were amalgamated to form the Royal Maritime Auxiliary Service (RMAS). 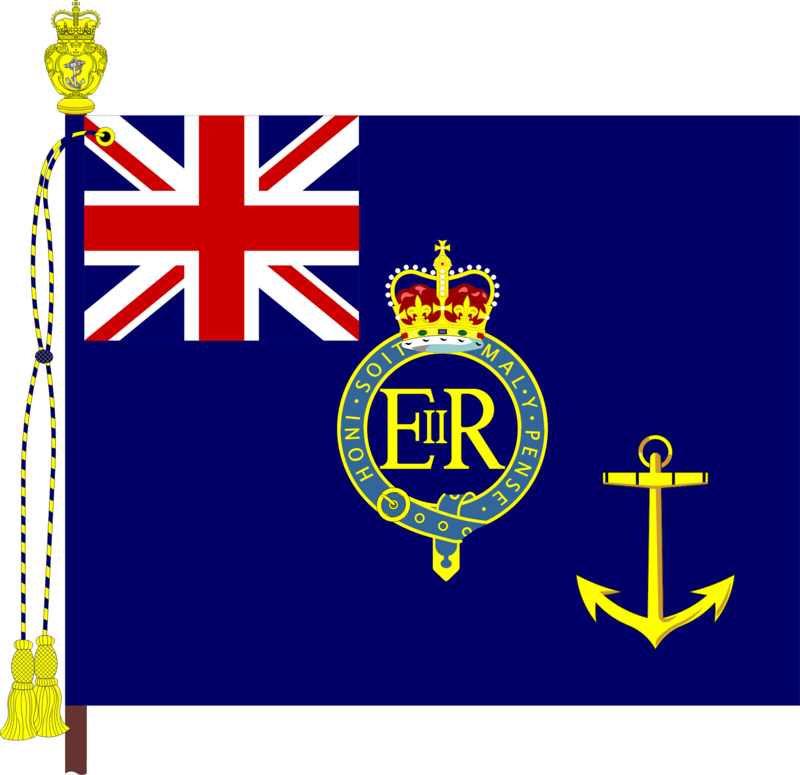 The ensign with two wavy lines below the anchor was now specifically the RMAS Ensign, while the old Admiralty Ensign was re-named the Government Service Ensign, and became the ensign of Ministry of Defence (Navy) owned vessels that were not part of the RFAS or RMAS. The following year ocean tugs, Ministry of Defence cable ships and some trials vessels were incorporated into the RMAS. 1996. In August most RMAS vessels were transferred to Serco Denholm Ltd, who operated them on a bare-boat charter under a government owned/commercially operated contract. They wore the Government Service Blue Ensign (horizontal yellow anchor, no waves). A few vessels remained in the RMAS. 2008. Serco Denholm Marine Services were awarded a fifteen year contract to manage all Royal Navy marine services, and on 1 April the Royal Maritime Auxiliary Service was formally disbanded in a ceremony at Portsmouth when the ensign on the salvage vessel "Moorhen" was hauled down. Note. The Royal Maritime Auxiliary Service should not be confused with the Royal Naval Auxiliary Service, which was a separate organisation. See "United Kingdom: Naval Auxiliary Ensign".